Cape Town is fondly called the ‘Mother City’, and it is home to more than 3 million people. 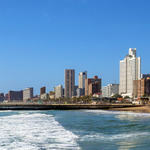 This coastal city is known for its harbour, Cape Floristic Region and wine routes. Cape Town is where you will get to experience an infinite amount of entertainment and cultural experiences! The city boasts an array of attractions, including Chapman’s Peak, the Zeitz MOCAA Museum and V&A Waterfront. Get ready for an adventure of a lifetime with cheap FlySafair flights to Cape Town! The city is home to Cape Town International Airport (CPT), which is a 15-minute drive from the Cape Town city centre. Book cheap FlySafair flights to Cape Town at Travelstart today! You must present a South African ID or passport when flying to Cape Town. Explore Cape Town’s attractions such as the Hout Bay harbour, Robben Island and Sea Point promenade.